After proper dry times, new wood should be cleaned using Defy Wood Cleaner prior to staining with Defy Stains. Defy Wood Cleaner is an oxygen bleach wood deck cleaning solution that is extremely effective at removing dirt, grime, mold, mildew, graying, and mill glaze found on new wood. Defy Wood Cleaning Solution is a biodegradable concentrated powder formula that mixes with water to safely prep new wood prior to stain application. Once cleaning new wood is complete, the wood will appear darker. This darker appearance is normal and will disappear once an application of Defy Wood Brightener is used. While the wood surface remains wet from cleaning, apply a generous coat of Defy Wood and Deck Brightener to lighten the wood to its original, like new appearance and to open the wood pores for better stain saturation and performance. After prepping new wood for Defy Stains, allow the wood to dry for 48 hours minimum before continuing with stain application. Note: Only 1 coat should be applied to new wood and the first time staining. You can apply another light coat if needed in 12-18 months. Yes, it can be prepped and have it rain between staining. If it does, just wait 48 hours after the rain to stain the wood. Try to stain the deck within 2 weeks of the prep. Last fall I applied one coat of natural pine to new wood (built earlier in the spring) I have quite a lot of leaf stains and other marks that have build up on the deck boards over the last year. Was planning to clean, brighten and apply more stain now, is that wise? If so, do I apply just one coat or the usual two coats, wet on wet approach? Also, if cleaning and brightening in phases, should I clean and brighten together or, can I clean the whole area over a couple days and then come back and brighten? Just wait until Spring. Clean and brighten for the prep and apply one coat. Okay. What could I use now to clean up the leaf stains other marks on the deck boards? The Defy Wood Cleaner and pressure washing in the Spring will clean this up. On the defy.com website it says for new wood to apply 2 coats of Defy Wood Stain but your site says to apply just one coat. So I am unsure of what to do. Please advise! Thanks! Only one for new wood. I have a new western red cedar deck, a month old now. Worried about it greying and weathering over winter if left untreated. Would you suggest still waiting until spring to stain? or do it just before bad weather kicks in? Yes. Staining too soon and the product will not soak in and could prematurely fail. I have a new pressured treated pine deck that is two months old located in Northeastern Illinois. How long should I wait before staining? Is it better to do before winter or wait until next year? 3-6 months as the article states. Best to do in spring of next year. I have 4 cabins that are 264 sq ft. How much product should I purchase? We would need the sq footage of the 4 exterior walls for each cabin added together, not the sq footage of the interior floors. Why do I need to wait 48 hours between cleaning and staining? So the wood can dry after the prep. I have a 16×16 ft pine wolmanized deck put up in August 2017 . I treated it with Thompsons water proofing in June 2018 and would like to retreat in October 2018 with the Defy clear pine stain. Would I need to remove the Thompsons water seal prior to applying the Defy clear stain? And if yes, with what solution do I remove it with? Yes, you will need to remove the Thompsons. Use the Defy Stain Stripper and pressure washing. Neutralize with the Defy Wood Brightener after. If I want to do a light sanding on new unstai ned wood (6 months old), do I do it before cleaning? I currently have one coat of Natural Pine on a 2 year old Cedar deck. I would like to change the color to Light Walnut. Do I need to strip off the Natural Pine first? I’m getting ready to build a cedar pergola and the lumber company is telling me the cedar will have been kiln dried. From what I read, US standards are around 6-8% MC for kiln dried lumber. I’m in Reno, NV which has pretty low humidity. Will I still need to wait a few months before applying your stain or can I stain before building? Hello. I cleaned my new 9 month old redwood deck with the defy cleaner. I did not use the Brightener, but now the deck has dried for 48 hours and I was planning to stain it. Should I go back and brighten now or is it too late? Defy does suggest using the wood brightener after using the cleaner to neutralize and open the grain of the wood better. Used Behr deck cleaner on my one year old cedar deck. Should I use your brighter before your stain? I’ve used the defy cleaner and brightener, but the brightener seemed to leave a residue, so I power washed again. It’s Weathershield 2 wood FYI. 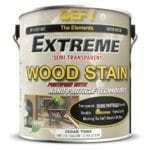 I plan on staining with the extreme in two days, but the forecast calls for rain on the 3rd day. I’ll have to do the stain in the evening. Will there be issues if the stain is exposed to rain in 24 hours? Is 36 hours adequate drying time with relatively low humidity? Hi. We are installing a new pressure treated deck and are unsure about staining. Waiting the minimum 3 months would put us into December. Everyone says it’s important to seal before winter, but with your minimum wait recommendation we wouldn’t be able to stain until next spring. What should we do? We are located in Maryland. You want a thin coat. Defy is a penetrating stain so it needs to soak into the wood, not lay on top of the wood like a paint. Do 1-2 boards at a time and their entire length. You should clean and brighten all wood first and then break the staining up into sections if needed. 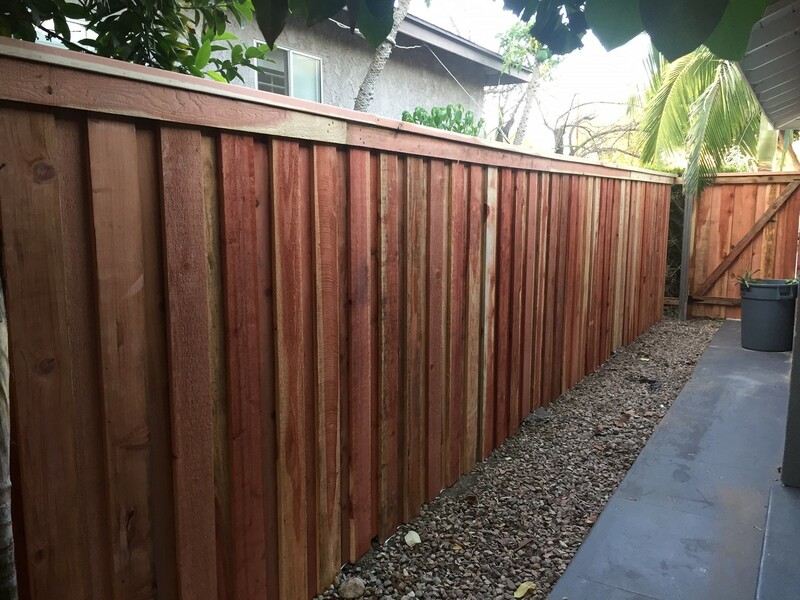 I had a new redwood fence installed 4 weeks ago. The vertical boards are rough cut, the horizontal 2×6 and 1×4 used for the fence cap are not. Planning to stain in a couple week. Will these preparation steps be necessary for this application? You should prep the smooth wood first before staining. Yes it will be okay to apply after the dew has dried, late in the day. Best to use both the cleaner and the brightener for the prep. This will remove dirt, oxidation, and mill glaze. I have had already applied the cleaner-brightener to the entire deck and then later applied the stain to 50% of the deck. But due to weather (rain) conditions applying the stain to the remaining half was delayed by a month. How do you suggest me to proceed for the rest half – just applying the stain only or cleaner/brightener-stain or go through the entire process of cleaner-brightener-stain ? Please advice. I’m planning to do it this week as the weather would be good (cold though). 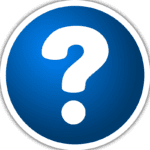 Or wait – until when? Clean and brighten all again is the best way to prep. Just used the cleaner and some of the boards have a white film? So the boards thart have darker parts should, i just re clean to try to even out the color? I’ll be using the brighter before I stain, but not sure brightener will even out color?? More then likely you did not remove all of the oxidized wood cells when you scrubbed or pressure washed. Try re-cleaningand maybe using a little bit more pressure. Brighten all wood to even color after. I just cleaned my deck and it’s been 2 days I haven’t applied the defy brightner. I’m planning to apply it on the 3rd day of applying the cleaner. Do, I Need To reapply the cleaner before applying brightner? Will direct application of brightner detoriate the look of the deck? No need to apply the cleaner again. Just apply brightener, wait 20 minutes, and rinse. can I use defy wood cleaner safely on a bronze marker? It’s such a good cleaning agent I was just wondering if would be safe. It may have a reaction. Hard to say and we have never tested it on that type of surface. What is the recommended prep for kdat lumber as we’ve been told to keep it dry prior to staining? New Kdat you should let season outside for 3-4 weeks then prep with the Gemini Restore Kit. Let the wood dry for 2 days after before staining. We have just installed a new pt pine deck (1000 sf) in the Vancouver area of British Columbia. Since it will rain for the next 9 months my deck may get 3 months of sun next summer. How long should I wait to let my wood dry out properly. Should i just use the extreme next spring? 4 dry months is not likely. Any advise for this climate would be helpful. Best to wait until Spring, prep properly and apply the Extreme. I bought my house about a year ago and I have no idea what stain may have been used on the wood fence in the past. The whole thing has turned gray from weather, I guess. Many of the boards were split, so we replaced quite a few with treated “dog ear” boards. Now we would like to stain the entire fence. Do I need to wait several months for the wood to age or dry before using Defy Extreme on the new boards? We live in Lincoln, Nebraska, so winter is coming soon. Thank you! Since it is vertical fence wood that is rough sawn, you do not need to wait. Prep with the Defy Wood Cleaner and Brightener to restore wood color. You can do decks all the way through October in NY. Wait 48 hours after prep and if rains in between, let it dry for at least 24 after the rain. TWP will be able to take rain 12 after application in most scenarios. i just had a new cedar deck installed in July the foothills in Seattle – rainy, rainy, then hot and dry July-October. 3 months puts me at the end of October – nights get cold already. should i wait until next spring, early summer or do it in October? Do in October. Prep first with the Defy Wood Cleaner and Defy Wood Brightener. Just one coat the first time staining. Hi, we have a pt wood retaining wall around our patio. It is a bout 5 yrs old and never been sealed/stained, but in a fairly shaded/protected environ. We just cleaned it up with a water/white vinegar solution, which worked quite well. My question is, do I need still need to use a deck brightener before applying a sealant/stain (still deciding between extreme clear and semi-transparent color)? My question is more about the pH level of the wood after using our 2:1 water/vinegar solution and its readiness for a stain, more so than improving the wood’s appearance. Yes you should use the Defy Wood Brightener to neutralize. The Extreme in on of the colors will last 2-3 times longer than the clear. Oh, okay. I thought that vinegar lowered the pH, as does a Brightener. Since I didn’t use an actual cleaner (raising the pH) I was hoping to be able to skip the Brightener/lower-the-pH part of the process. The wood is quite clean and light after the vinegar scrubbing. Am I misunderstanding the function of the Brightener (to lower the pH from the level raised by the cleaner)? I’m a newbie to the wood deck/fence world and trying lean as I go. Thanks for your patience. Sorry, vinegar is acidic and would lower the pH. Acidic products or brightener are not cleaner though. If clean it is probably good to proceed as is. Use the Defy wood deck cleaner after the sanding to remove sand dust and open the wood grain. Stain with the Defy Extreme for this in AZ. Thanks! Thanks! South facing logs take serious sun beat. Painter says two coats, but should we stick with one coat since wood is new? Also, we are buying a new cedar play/swing set that comes stained, but is recommended to add a water sealant to extend wood warranty. Could I just apply the defy extreme over the existing stain? Appreciate your help. No you cannot apply Defy on top of the stain on the playset. Only one coat for newer wood. OK thanks. Poles were installed 2 weeks ago. Just noticed numerous small beads of sap coming out of the wood. Ordering Defy Extreme tomorrow, so still have to wait maybe a week for shipping. Any idea what I should do about the sap? Nothing you can do about stopping the sap. I’m not sure whether the treated pine wood on my new deck would be considered rough or smooth and gather that determines when I should stain it. Can you please advise? Katherine, decking is always smooth. Unrelated question – if we want to paint a decorative, colorful pattern on the deck – not on the whole deck, just on part for a little, fun decoration – what would be your recommendations about how to do that visavis the stain? Katherine, not sure on this. Probably paint first then stain around it. If a little stain gets on the paint it will wipe right off. Hi – it’s me again. I applied the cleaner/brightener to the new cedar using a mop. I got some inconsistent results where after the brightener there are some noticeable areas where it’s brighter than other areas. I’ll see how it looks after it is dry but wanted to see if this is OK or if this will show up after I stain and should re do the cleaner, brightener or both. dmk, if is looks consistent when wet than it should look consistent when stained. You can always reapply the brightener. So I cleaned/brightened yesterday and today it’s raining. How long after the rain has stopped can I start to stain? Ok just watched the video and says 12-24 hrs… So which one is it? Ok so I’m a little in a bind, won’t be able to do it until a few weeks in that case. I can wait until Sunday afternoon which would be approx 36 hrs or should I just wait 2 weeks? OK I ended up waiting a couple of weeks because of the rain. I stained the past weekend and seeing inconsistency in the darkness, is this normal? It appears that the stain took better in some areas vs others. Can I do anything to improve the look? I did – it’s in the previous post. A very light coat would probably even it out. Issue is it already cured and applying a coat now “possibly” could create and issue. Best to wait a few months if possible to get this coat on. Maybe end of Summer. What about sanding it and reapplying? Hi – per the recommendation I waited over the winter to stain my new cedar deck. Unfortunately it was a brutal winter in the northeast and got bunch if cracking in it. Will the defy extreme protect the deck from further deterioration or is there another product I should be looking at? Derrick, cracking is normal for exterior wood and no stain will stop this from happening eventually. The Defy Extreme is an excellent product and would work to protect the deck. Is it normal just after less than 1 year? Hi, I think it is clear from your communications I should wait, yet, I have a new redwood pergola, winter is weeks away, appreciate your advice. Hi – I just build a new cedar deck, I’m in NJ and winter is coming. I’m concerned with the winter weather coming and snow falling on the unprotected deck, should I be worried? What are the downsides of waiting a shorter time before coating? Derrick if you stain before waiting the required 4+ months, the stain will absorb very well and will be prone to failing faster then normal. Most likely you will need to redo next Spring. Only 1 very light coat if you do it this year. Not sure if my last reply went through. Did you mean that the stain will NOT absorb very well? Is there an issue with leaving uncoated? Derrick, yes Not very well. Wood should be fine through the winter. I’ve used oxygenated bleach cleaner on the cedar siding on my entire home. Tried the brightener and it makes no visible difference whatsoever. 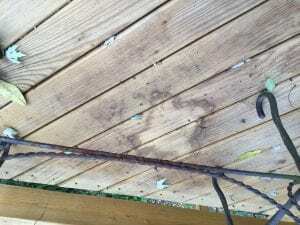 Knowing that, is brightening a necessary step prior to staining? Yes as it neutralizes the cleaner. Gary, if the wood is rough than you can stain. If smooth you should wait and prep with a cleaner and brightener. Rough wood does not bead water. we shouldn’t do anything to the wood for a few months, my concern is that we are headed into our rainy season, what should we do. Chuck, a good quality pump sprayer or an airless sprayer will work. Two weeks ago we installed a 20×5 ft cedar deck that’s covered but gets morning sun. How long should we wait to start prepping for the stain? Celeste, 2-3 months to let the wood dry. I have a new Redwood deck. What is the best Defy product to stain and seal redwood? How long should I let it season before I clean, brighten and stain?